I've always been partial to long book reads. Quick "airport pocket novels" are not my style. I prefer abundant, well-written stories which carry the reader through several days rather than just a few hours. What's the point of settling down with a good book if you can't enjoy it for a period of time? The Collective Obsessions Saga was originally hatched from my first full-length novel titled "Larkin" (now book three in the saga, known as The Twain Shall Meet). I wrote the story in its initial form in 1984. Over the ensuing years, the tale took many different directions. More than two decades after the book was finished, I had the seemingly impossible notion to continue the family saga. Some of the characters cried out for more - closure if you will - so I went back and created the beginning. In essence, more than half the Collective Obsessions Saga was already written with the likes of The Advent, The Twain Shall Meet and The Keeper's Journal. These books turned into "parts" in the saga with their corresponding time periods in the storyline. However, since I was never too thrilled with the book titles (one of which was out of my control), they were changed for their appearance in the saga. The "missing years" also have new scenes and characters, most of which were created as I went along. The series begins with The Advent, which runs from 1865 to 1920. Since there was a forty-one year gap between The Advent and the next story (The Twain Shall Meet), I wrote a new second part for "Collective Obsessions" titled Quixotic Crossings, which takes place between 1926 and 1958 and involves more about the characters of Claude Mondoux, Phoebe McGarren and Colm Sullivan. Larkin was renamed The Twain Shall Meet (covering 1961-1975), to be followed by a new part called Enthrallment (1980-1992), which brings to light the origins of Carly O'Reilly and her relationship with the unknowing Liam Larkin. The late-in-life reunion between George Sullivan (aka Ben Webb) and Susan O'Reilly is revealed, and the gentle romance between Sean Larkin and Dana Maitland is explored. Jack Sansovino makes his debut in Enthrallment, the fiendish character becoming a dramatic part of the saga finale. Fall of the Curtain comes next (now known as The Keeper's Journal), which takes place between the years 1994-1995. Following this, Hearts Desires (1996-2000) describes more interweaving between the next generation of the Sullivan and Larkin families, as well as the lives of Brose Larkin, Jamie Page and Angie Cimarelli. Jack Sansovino also resurfaces, his influence heavily felt by Jamie. The Twilight is a new part of Collective Obsessions, covering the years between 2001 through 2004 and detailing the surprising death of a long-time character. The last part of the saga became Megan's Legacy. The story ends in 2008, which signals a coda for the chronicle. Part of the long writing process for the Collective Obsessions Saga involved killing off some of my favorite characters in the storyline. It's only natural as people age with each additional story. They cannot live forever. It might have been easier to leave the saga at four books, with some of the characters remaining immortal because I hadn't written proper endings for them. In creating the new parts, I was forced to look at existing characters that were obviously aging. Some of them were "killed off" while others died naturally. I did away with some of them gently, while others met insidious endings. 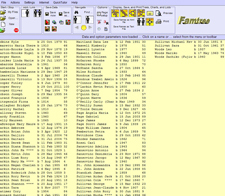 I mapped out a detailed family tree to avoid inconsistencies throughout Collective Obsessions and created a spreadsheet to track character quirks and descriptions. The books became one enormous project which involved more than two decades of writing and research, with several pit-stops in between as I carried out my own life. 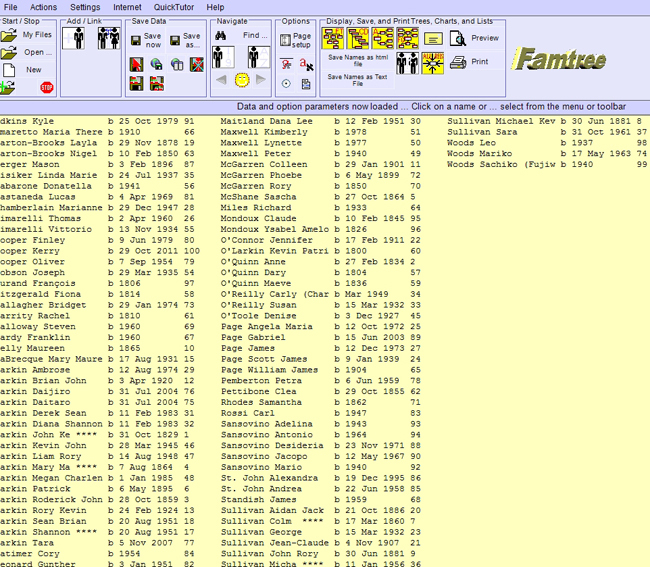 Since I'm a writer often inspired by images, my spreadsheet for Collective Obsessions became naturally larger as time progressed, but also included thumbnail pictures of people I felt represented my fictional characterizations. The images were not indicative of true personality traits of real people by a long shot, but rather a general idea of what I envisioned as the "outer shell" of each character. For instance, I based John Larkin's appearance on David Selby, who portrayed Quentin Collins in the Dark Shadows TV serial. The physical aspects of Mayor David Azoulay, who appears in Hearts Desires, The Twilight and Megan's Legacy, was inspired by Mark Feuerstein, star of the USA Network series Royal Pains. Colm and Mike Sullivan, who are described as closely resembling one another in the various storylines, are based on Jason Connery as he appeared in Robin of Sherwood. Each character had their own snapshot, which rarely changed over the course of the years. Thanks to the online "pin-board" known as Pinterest, I'm now able to share mind's-eye images of my fictional characters. As each book in the Collective Obsessions Saga is released by Club Lighthouse Publishing, I will continue to add photos to the individual pin-boards. Be that as it may, I would like to emphasize that all eight books in the Collective Obsessions Saga are works of fiction. Any resemblance to actual persons living or dead is purely co-incidental. Larkin City, Maine is my own creation, although in my mind it exists between the real cities of Searsport and Stockton Springs. People assume I chose the locale because of Stephen King's predilection for the place, but the selection was actually a result of my childhood fascination with the TV serial Dark Shadows, which was set in the fictional town of Collinwood, Maine. For a writer, characters come alive and take on quirks of their own. I can't claim to hear my characters actually speaking to me, but they do develop faces and personas of their own in my sometimes unpredictable imagination. There were times I become daunted by the size of Collective Obsessions, but because I know the characters and the story so well I never lost faith. The process was still very long, however. There were days I felt as if I was getting absolutely nowhere, but then there were others that moved quickly to boost my confidence. Finishing the Collective Obsessions Saga was bittersweet. While elated the story was finished, I was also a bit reluctant to let my characters go. They have frolicked in my imagination for so long, as if part of my soul, that it was hard to turn that final page over, once and for all. The writing process left me threadbare on a personal level, but it was deeply satisfying in all ways that matter to me. Deidre is a native of Greenwich, Connecticut. She has also lived in San Francisco, Tucson, Reno and Spokane, among other US cities. Her favorite authors and biggest writing influences include a mixed bag: Evelyn Anthony, Elizabeth Byrd, James Clavell, Dorothy Daniels, Ken Follett, Marilyn Harris, Susan Kay, Stephen King, Norah Lofts, Colleen McCullough, Marilyn Ross, Edward Rutherfurd, Bertrice Small, Barbara Taylor-Bradford, Leon Uris, Alison Weir and Kathleen Woodiwiss. In her free time, Deidre loves to read, experiment with cooking, play computer games and tend to her beloved pets, Rainee and Kiki. She also writes under the pseudonyms Deborah O'Toole and Shenanchie O'Toole. 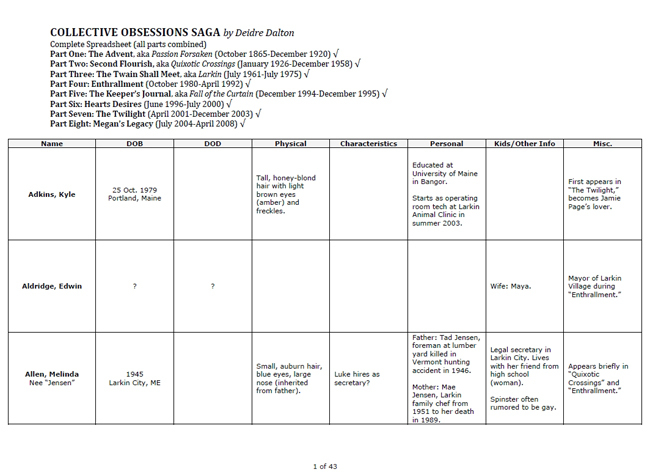 (Above): Sample of the 43-page spreadsheet used to track characters in all eight books of the Collective Obsessions Saga. Click on image to view larger size in a new window. 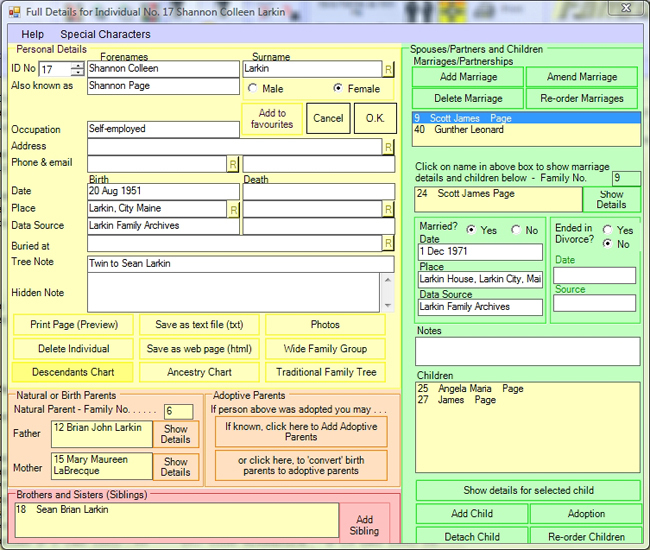 (Above): Screenshot from the Fam-Tree program, where the Larkin-Sullivan Family Tree was built. Click on image to view larger size in a new window. 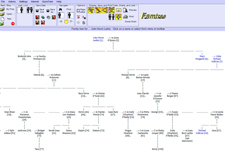 (Above): Another screenshot from the Fam-Tree program, where the Larkin-Sullivan Family Tree was built. Click on image to view larger size in a new window. 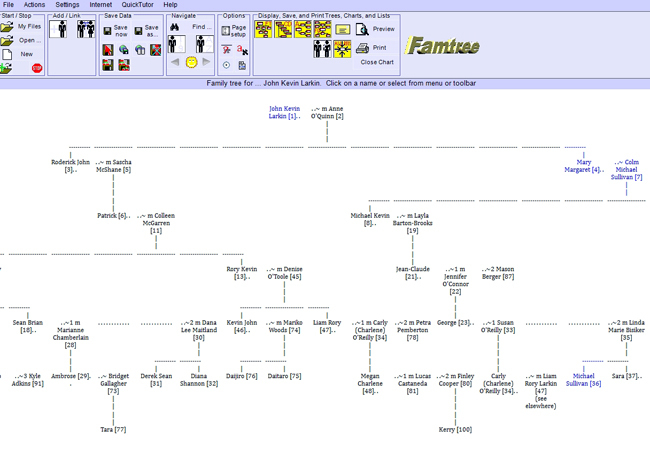 (Above): Another screenshot from Fam-Tree showing a traditional family tree. Click on image to view larger size in a new window. 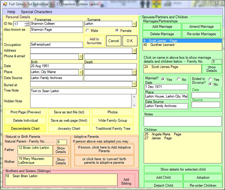 All downloadable documents are in PDF (Adobe Acrobat) format.